In a previous blog post, we wrote about three mistakes that people make with their kitchen lighting. While no lighting mistake can completely ruin a home, it can greatly impact the home’s design and ambience. At Southern Lights, we’re dedicated to helping every customer find the lights that they need. 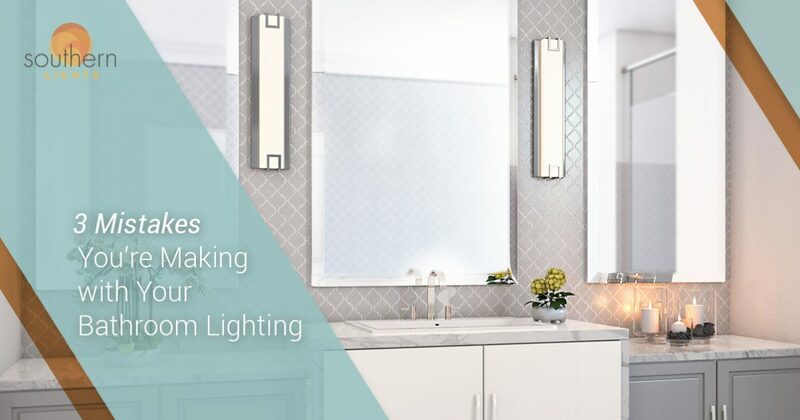 In this post, we’ll take a look at three mistakes that you could be making with your bathroom lighting and how to remedy them. Growing up, you may have had a bathroom with one central light fixture, which was probably a flush-mount or semi flush-mount light. It didn’t provide enough illumination, but it was the only choice, so you made it work. If your current home has a bathroom with just one light, then you’ll want to remedy the mistake as soon as possible. The central fixture is important, but it shouldn’t be the only light in the room. It’s there to provide ambient light, but you also need task and accent lighting in the form of vanity fixtures and more. Visit our showroom today to see how we can help you! Vanity lights are there to provide task lighting for anything you’re doing in front of the mirror, such as shaving, putting on makeup, or brushing your teeth. They’re meant to brighten the vanity area, but if they’re the wrong size for the space, or they cast unflattering lines on your face, then they have to go. Replacing your vanity lights with a new style or putting lights on either side of the mirror can provide the light you need from an angle that’s more beneficial when it comes to personal hygiene and grooming. If you have bulky vanity bulbs that seem to be in the way of the mirror, then consider updating to smaller, more energy-efficient bulbs that are more in line with your design tastes. If you’ve ever been in a bathroom where the light was too yellow or orange, then you may have had a hard time staying in there for very long. On the other hand, if the lights seemed to cast a blue color on everything, then you may have found the space too bright and sterile. The right color temperature is imperative for a bathroom, and the bulbs you want will range across your powder room, guest bath, and master ensuite. It’s important to keep in mind what each bathroom will be used for on a daily basis, and if you’re concerned about the color temperature of your bulbs, then our staff will be more than happy to help you find new options. If you’re concerned that you’re making mistakes with your bathroom lighting, or that the lights you have just aren’t working the way you want them to, then let Southern Lights help you make the necessary upgrades. Our showroom is filled with outstanding fixtures for every home, and our knowledgeable staff can answer all of your questions.